Grip-it™ Grip glue has been specifically formulated for applying grips and mats for recreational vehicles. 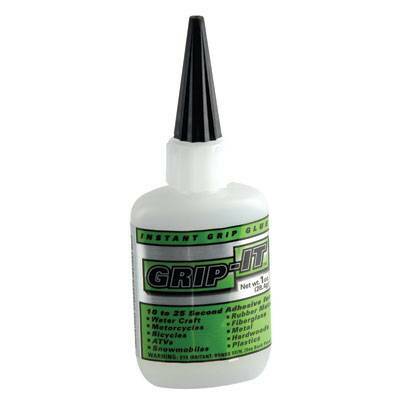 Grip-it™ Grip glue has been specifically formulated for applying grips & mats for any recreational vehicles. -10-25 second working time and the grip is rideable within 5 minutes. (Also works great for replacing rubber mats. A 1 oz. bottle will bond up to 12 sets of grips. 2. Grip-it™ acts as a lubricant so the more you use the easier the grip will slide on. There will be an excess of glue that you’ll need to wipe immediately with a cloth towel. 3. It's easier to apply grips if you “spin” the grip as you’re sliding it on. Stop turning when you have the grip in the proper position. 4. Determine mat alignment before applying Grip-it™. Apply the furthest away from you first, and then work your way toward yourself pressing down firmly. 5. Always work in a well-ventilated area. Don't ever worry about falling off your machine from a slippery grip!! This is located in the "must have" dept of your shop. Grip-it™ before you ever rip it! !